Win tickets to Saigon Players’ The Rocky Horror Picture Show! | Hello Saigon! It’s Halloween and Saigon Players and Mc’Sorley’s are bringing back The Rocky Horror Picture Show to HCMC. First seen last year as a collaboration by The Lab and Saigon Players, The Rocky Horror Picture Show is back to give you the heevy jeevies. 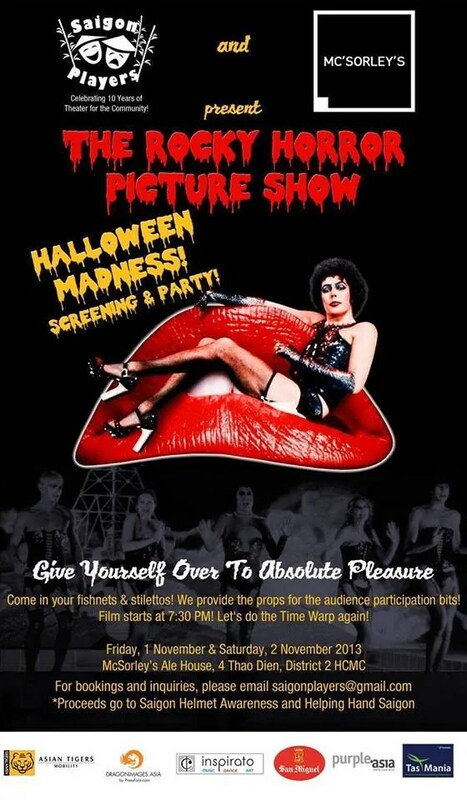 Enjoy the film screening of The Rocky Horror Picture Show with shadow actors! The Saigon Players began in 2004 with their debut production of A Dog’s Life. And since then, they’ve gone on to produce 20 smashing English shows — wherein all proceeds go to their favorite charity. This time, their chosen charity are Saigon Helmet Awareness and Helping Hand Saigon. And in celebration of Saigon Players’ 10th Year Anniversary, they’re giving away 2 free tickets for the November 1, and 2 more for the November 2 showing of the Rocky Horror Picture Show! 1. Give 3 productions by the Saigon Players. 2. Where is The Rocky Horror Picture Show showing? 3. What are Saigon Players chosen charity for The Rocky Horror Picture Show? 4. When do you want to see The Rocky Horror Picture Show? This contest ends on October 29, 11:59 PM. Winners will be announced on October 30, 2013. This entry was posted in Event and tagged English theatre production, Ho Chi Minh City, Mc'Sorley's, Saigon, Saigon Players, The Rocky Horror Picture Show, Vietnam. Bookmark the permalink.